For privacy reasons, you may have the right to ask for certain personal information relating to you to be removed from Google SERPs. 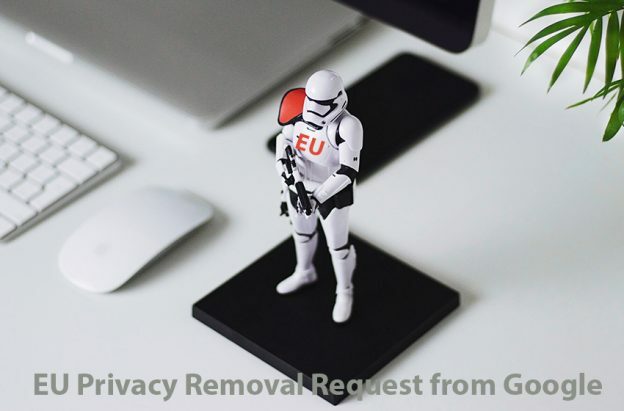 The EU Privacy Removal online form is for requesting the removal of specific results for queries that include personal name and information from Google Search. If you want to request removal of personal information from another Google product too, kindly submit a request through that product’s form, which you can reach at our Removing Content From Google page. When you make your request, Google will balance the GDPR privacy rights of the individual concerned with the interest of the general public in having access to the information, as well as the right of others to distribute the information. For example, Google may decline to remove certain information about financial scams, professional malpractice, criminal convictions, or public conduct of government officials. You will need a digital copy of an identification document to complete the form. If you are submitting request on behalf of someone else, you will need to supply identification documentation for them too. To start your application, please fill the following EU Privacy Removal online form.